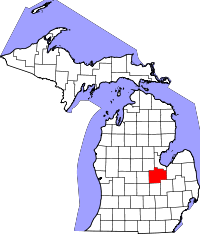 Saginaw County, part of the Flint/Tri-Cities area of Michigan, lists a few options on the County Clerk website for acquiring or researching genealogical and vital records from the area. To simply purchase copies of records with a credit card, users are directed to use the county VitalChek system. Certified copies are also available directly from the County Clerk genealogical research department, and all records are listed from 1867 to the present except for divorce records, which begin in 1995. Up to five researchers can fit in the research area at one time, and the County Clerk staff will assist with records searching once all other customers have been helped. A free-to-use database with death and marriage records dated from 1995 to the present is linked to from the Clerk site, though records contained in the database are unofficial. The Saginaw County MIGenWeb Project is an extremely thorough source of additional genealogical resources.